Ceramic and stone tiles combine elegance, durability, and easy-maintenance which make them a highly sought after floor covering. Perfect for bathrooms, kitchens, and floors throughout your home, tiles are allergen-free and come in a vast selection of colors, sizes, and textures to enhance any décor. Increasingly popular today are wood-look tile floors, which mimic the warmth of natural wood, but with increased durability and without the worry of damage from water spillage. Ceramic tile, no matter the style, adds value to a home or building, while allowing complete versatility in terms of design. When properly installed, a tiled floor is practically indestructible, and unlike carpet, vinyl, or laminate flooring which have to be replaced periodically, properly installed tile can last a lifetime. To protect the integrity of your investment, tiles need to be protected from multiple angles: from underneath, at perimeters and transitions, and within large expansions. The key to building a floor that lasts lies between the structure of the floor and the bed of tiles on top. 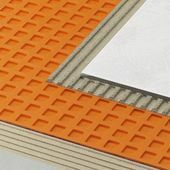 Uncoupling refers to the act of preventing any movement and stress that occurs in the subfloor from transferring through to the tile above, thus preventing cracked tiles and grout. 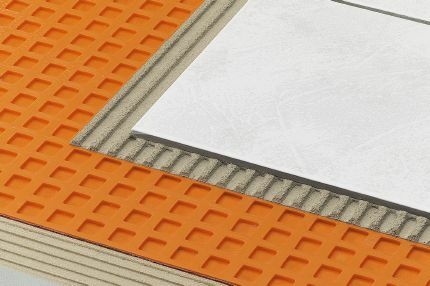 Specifically designed for ceramic and stone tile installations, DITRA provides effective uncoupling protection, preventing cracked tiles and grout. Made of polyethylene, DITRA also serves as a waterproofing layer that protects moisture-sensitive substrates, such as plywood/OSB. 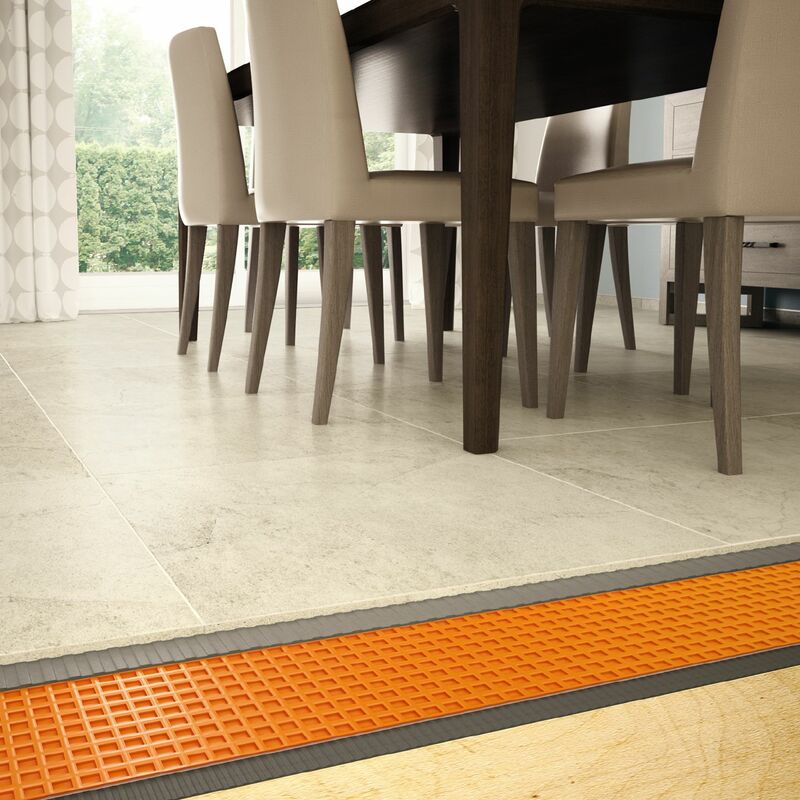 Free-space on the underside of the matting provides a route for excess moisture and vapor to prevent damage to the tile layer above. 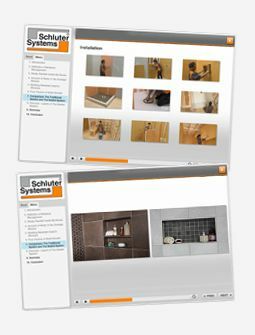 DITRA performs all these functions while still providing adequate support/load distribution for the tile covering. 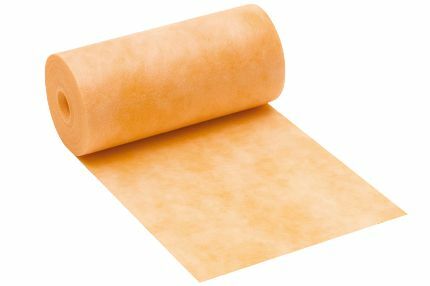 Since DITRA is made of waterproof polyethylene, the only extra step necessary is to seal the seams and floor/wall connections. This is easily accomplished by applying KERDI-BAND to these areas using an unmodified thin-set mortar. The result is a waterproof installation that will not suffer damage in the event of an unexpected water leak. Ceramic cove base represents a neat, hygienic method for treating transitions by providing a curved surface that prevents the collection of dirt and is easy to clean. However, the limited availability of ceramic trim pieces has resulted in the use of sealant and caulk to treat such transitions. These joints must be continually maintained throughout the life of the installation. DILEX cove-shaped profiles provide an attractive, clean, and maintenance-free alternative for inside wall corners and floor/wall (including counter-top/backsplash) transitions. They also allow the use of any tile line, regardless of the availability of trim pieces. RONDEC is an edge-protection profile designed to finish edges and outside corners of tiled surfaces. With its symmetrically rounded reveal, RONDEC is offered in a variety of materials and colors to coordinate with any style of tile. A full line of accessories are also available to complete the project. What’s more? RONDEC completely eliminates the need for unsightly caulking. The QUADEC profile offers the same quality of edge-protection, but features a squared edge for a clean and crisp look. While an installed ceramic tile floor is rigid by nature, stress buildup will occur within large surfaces and at perimeters, causing cracking and loosening of the tile covering. In addition, caulking is often used to create a movement zone. Unfortunately, caulking has a limited lifespan and eventually breaks down, leaving the tiled edges exposed and vulnerable to damage. 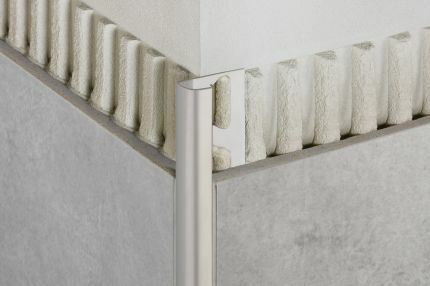 Perimeter movement joint profiles provide the flexible connection of tiled surfaces to fixed building elements, such as the featured cabinet. Perimeter movement joints also prevent sound bridges, thereby reducing sound transmission. Surface joints must be placed within the tiled surface regardless of substrate conditions. They provide stress relief from movements in the tile field due to thermal and moisture expansion/contraction and loading. Because ceramic and stone tiles are inherently brittle, their exposed edges can chip and crack if left unprotected. Transitions between floor surfaces and at thresholds are particularly vulnerable to damage. 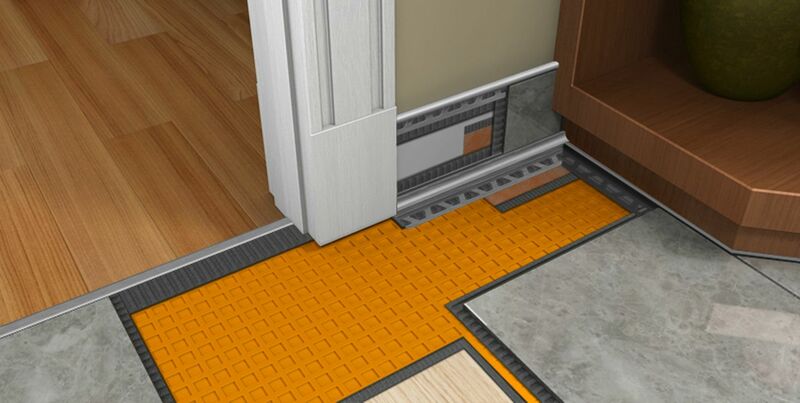 Schluter®-Systems offers a variety of profiles to provide edge protection and transitioning at thresholds and between adjacent surfaces, resulting in durable, maintenance-free tiled coverings. 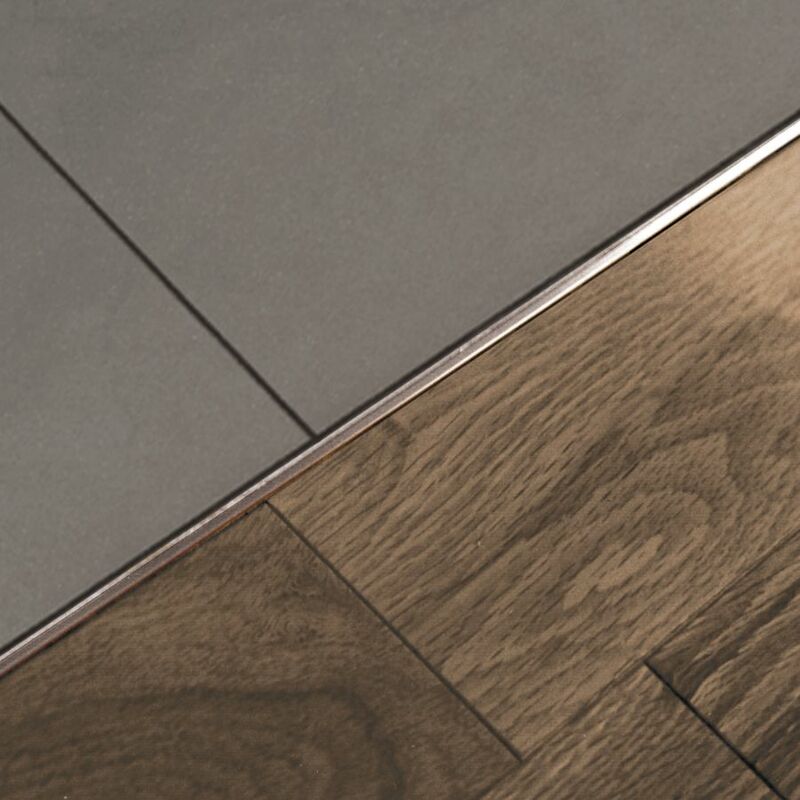 Create smooth transitions between floor surfaces.